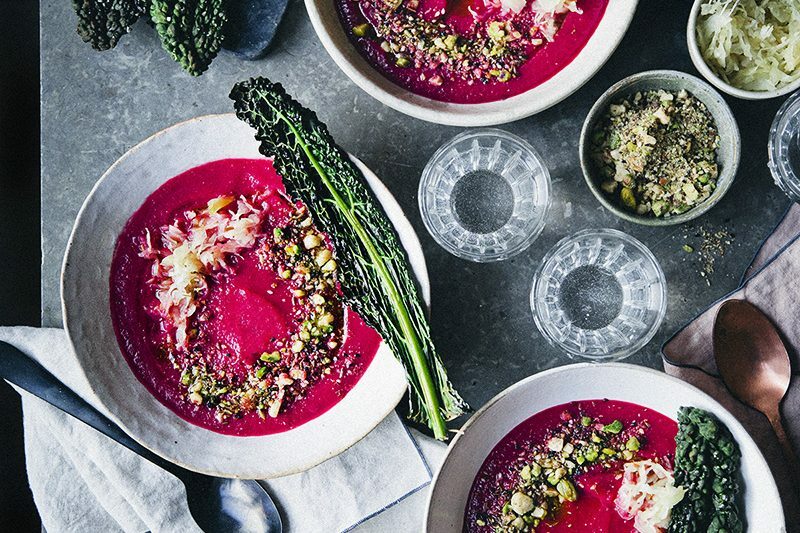 We wanted to fit a quick post in before the holidays, in case some of you are still struggling with vegetarian Christmas recipes. We are actually not celebrating a traditional Christmas this year. Not at all. But this is a delicious little something that we prepared for ourselves a couple of times before we left. 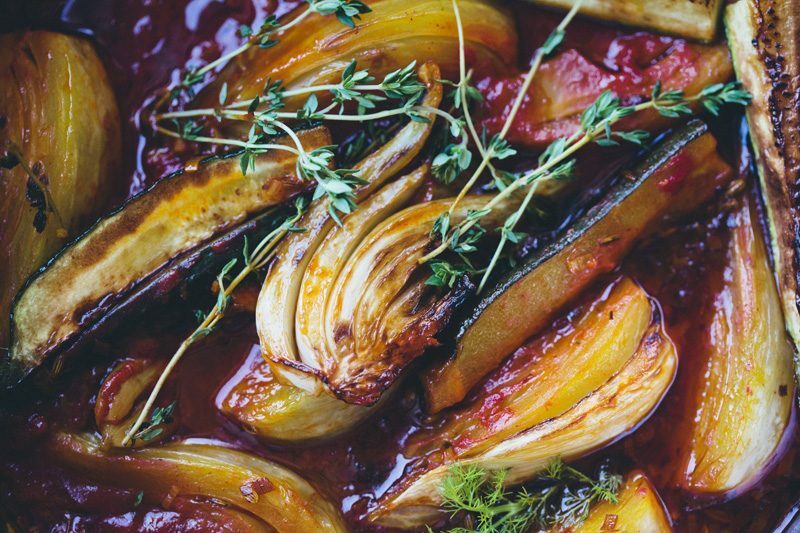 Oven roasted aubergine halves – slightly scorched on top and deliciously soft inside – have always been a favorite of mine. To give them a more festive and seasonal twist, we have topped them with a blanched Brussels Sprout & Lentil Salad and garnished them with a generous handful of pomegranate seeds. It’s a simple trick, but it always looks more festive when you top large roasted vegetables with any type of salad. Roasted Portabello mushrooms would also be wonderful as a base, if you are not too fond of aubergine. 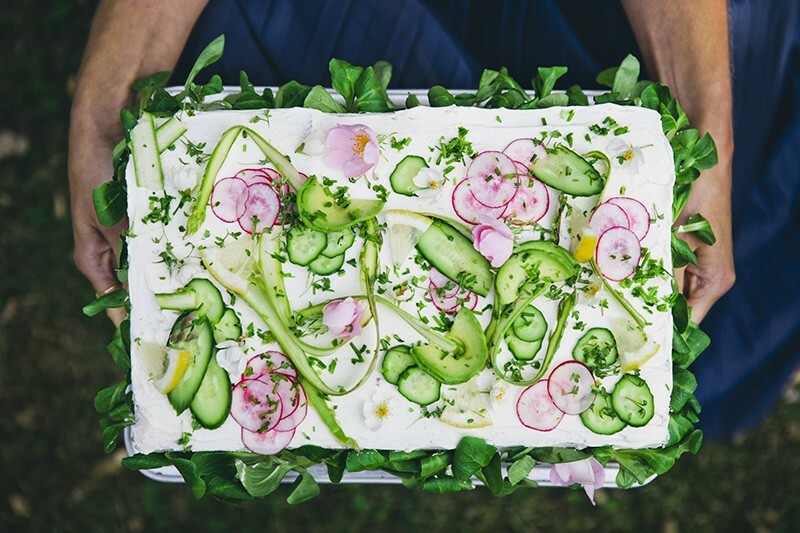 This would look great on a vegetarian Christmas table, together with a few spreads and salads. If you are planning on making it or any of our other recipes for Christmas, we’d love to see your creations on Instagram. 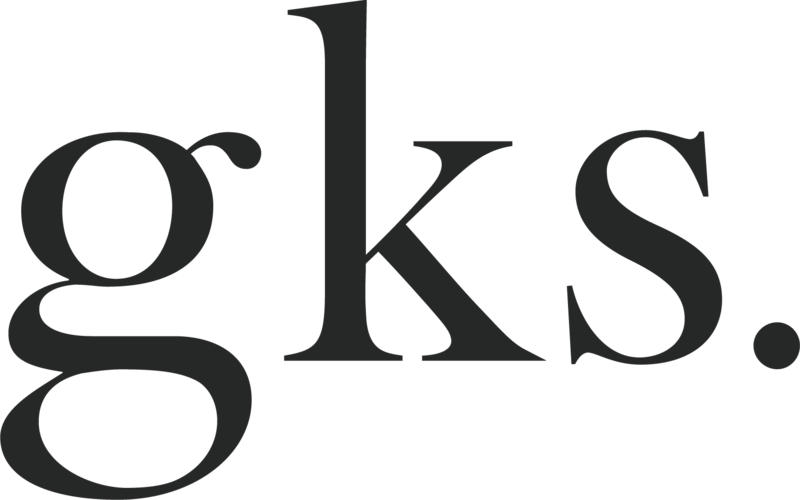 Perhaps you could hashtag it #gkschristmas so we won’t miss out on anything? Here are a few other Christmas dinner suggestions from our archive. Folks, have a groovy holiday. Thank you for a completely unbelievable year! See you on the other side. Preheat the oven to 220°C. /430°F. Divide the aubergines/eggplants in half, lengthwise and place on a baking tray. 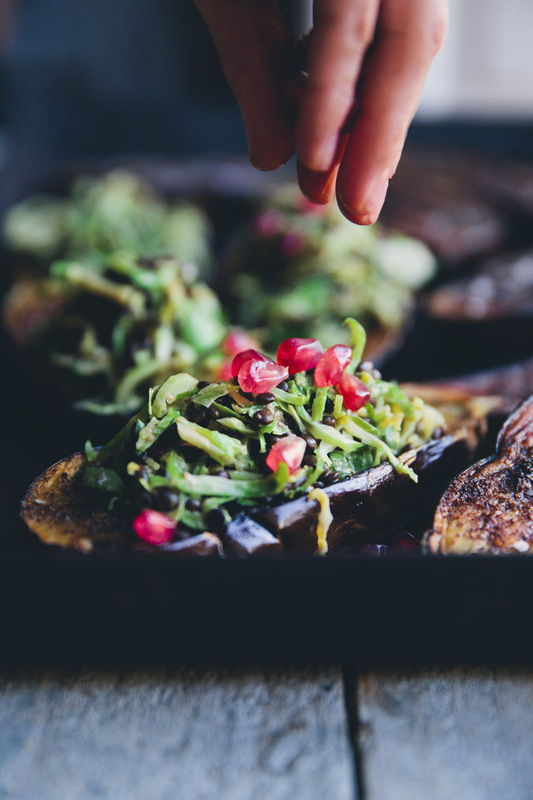 Rub each aubergine/eggplant half with ghee, coconut oil or drizzle with olive oil. Sprinkle with sumac and salt. Bake in the oven for about 40-45 minutes, this depends on the oven and the size of the aubergines/eggplants. They are done when they are completely baked through and very soft inside. Meanwhile prepare the salad. Rinse and drain the lentils. Place in a saucepan and add 2 cups water and salt. Cover with a lid and bring to boil. Lower the heat and cook gently for about 20 minutes or until tender. When done, set a side to cool. Meanwhile bring a large pot of water to a boil. Rinse the brussels sprouts, pick the outer leaf and shred very finely with a sharp knife (be careful) or use a food processor. Then add the shredded greens and blanch them for no more than a minute. Pour into a colander and rinse immediately in cold water. Drain well. 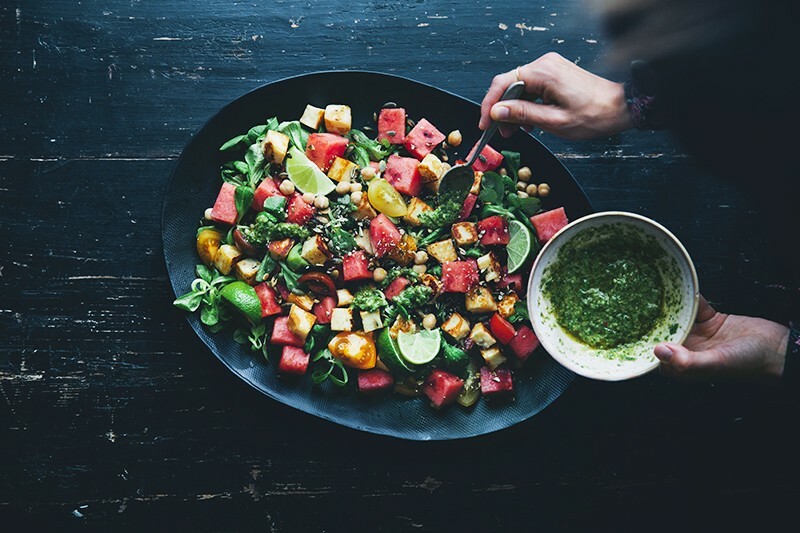 Prepare the dressing by whisking all ingredients in a small bowl. Set aside. Place the blanched brussel sprouts and cooked lentils in a large mixing bowl. Pour the dressing over and toss to mix. 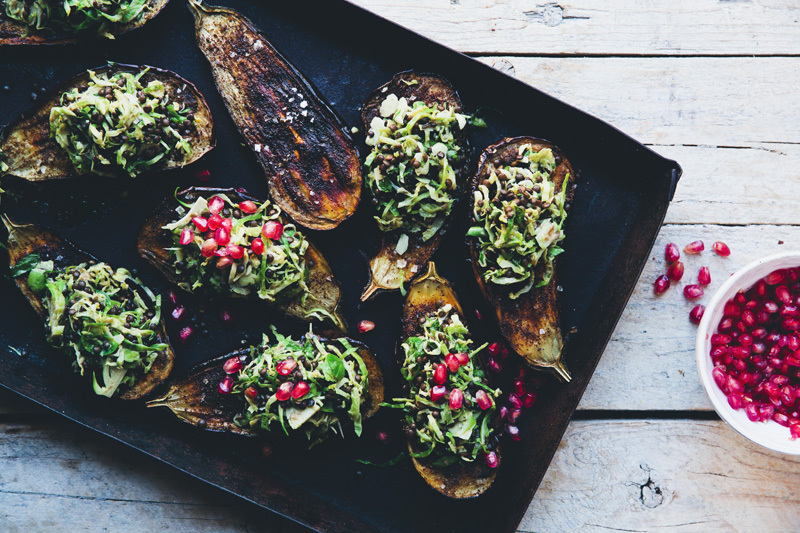 Remove the baked aubergines/eggplants and top the halves with a couple of spoonfuls salad and pomegranate seeds. Ready to serve. Next Raw Cashewgurt Bowl + News! I made the baked aubergine for our Christmas dinner. The topping was a winner but I have to admit that the baked aubergine was a little bland. The roasted part of it was delicious but the rest below was somewhat tasteless and my guests did not eat was left in the 'shells'. When I make this recipe again, I will slice the aubergine in thick slices so that it gets well roasted all around. Congratulations on your new book! Happy New Year! What a tasty year at has been. Cheers to 2014 and more tasty food. I must admit, I had to look up what aubergines were. Now I get it. Aubergines and eggplants are the same thing. I thought you were providing a choice. Meanwhile, though I am not vegetarian or vegan, this a must try for me. I'll be using olive oil and smoked paprika. Thank you! Wow, that looks so amazing! 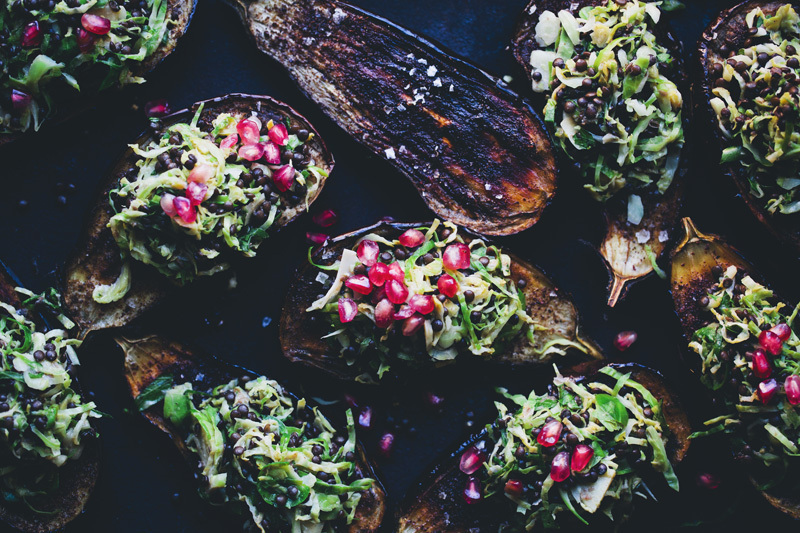 I love egg plants, brussel sprouts, beluga AND pomegranate - I definately have to try this! What a beautiful dish to celebrate the end of the year! Brussels sprouts, beluga lentils and pomegranate make a bright trio on top of the aubergines. Have yourselves a Joyeux Noel and Happy Healthy New Year too! We are heading up to Connecticut in the morning and I made a jar of your nutella for the road to dip with some fruit wedges. Big hugs. Aubergines are my favorite! Specially the bake one. Photographs are stunning and gorgeous! Hope you guys having great time in warm Shrilanka! Happy Holidays and looking forward to many more pictures from your trip. So pretty! I love the colour. I also couldn't think of Christmas without your mushroom and hazelnut loaf. Best wishes from Greece! I love oven roasted aubergine halves! Ottolenghi has a great recipe with zatar which I've made several times. This recipe looks stunning and delicious. A dish not only for vegetarians! Wishing you three wonderful holidays in Sri Lanka! I'm sure it's a lot sunnier than here in Scandinavia ;) Enjoy. Yes!! This is exactly what I want for Christmas. Thank you!! This would make such a lovely Christmas dinner! Nothing better than eggplant. I think this will impress even my carnivorous relatives. Thanks! And happy holidays! Great and simple recipe! Happy Holidays!